It’s a regular scene in Laguna San Ignacio, about 600 miles down Baja’s Pacific coast: a flotilla of whale watchers squealing like giddy children at the first sight of a baby gray whale. The enormous sea mammals are naturally curious and as gentle as dairy cows. During the winter breeding season, females and their calves bob around the small boats, letting visitors kiss their rubbery heads and pet their big pink tongues. These encounters are made possible by local fishermen who bring tourists to the whales’ favorite spots, but keep people from harassing them in their breeding grounds and nurseries. This ecotourism helps support the economy in nearby villages and encourages them to protect marine sanctuaries and limit fishing. It’s one example in a promising micro-conservation model profiled by science writer Erik Vance in his article “Stewards of the Sea,” which appears in National Geographic magazine. Vance visited abalone divers in the town of Punta Abreojos, a few miles north of Laguna San Ignacio, where fishermen formed a cooperative in the 1970s and started practicing selective fishing. Following years of declining stock, they decided to delay harvest until four months into the official season, Vance says, giving the abalone more time to fatten up. Villagers can then take fewer shellfish to get the same poundage, and leave more to reproduce another generation for the next year. It’s paid off big time, Vance says. 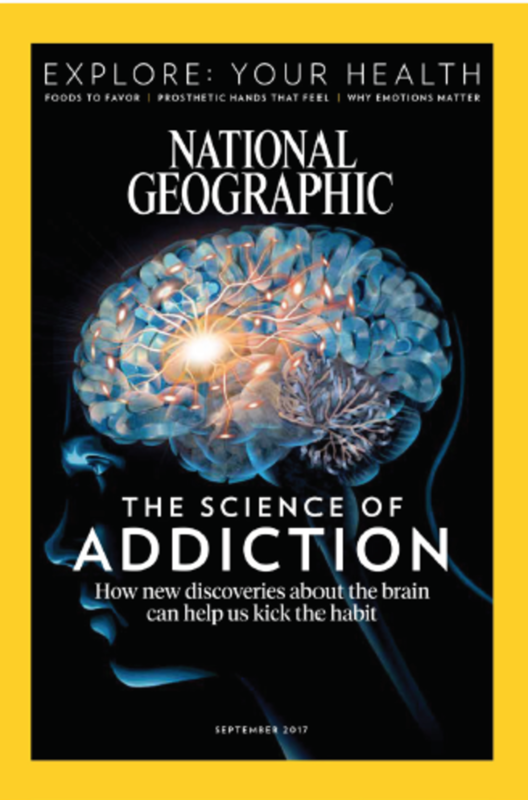 These days, divers earn top dollar working fewer hours, and the funds they put into their fishing cooperative pay for their kids’ college and the fishermens’ retirement. In other parts of Baja, though, this cooperative model took some persuading. Fishermen were willing to conserve, but wanted assurances that neighboring villagers weren’t going to take their leftover stock. Vance says environmental groups came up with a strategy to create mutual trust. They set up soccer matches and soccer tournaments between neighboring villages. Science writer Erik Vance succumbed to baby whale mania himself while researching the benefits of ecotourism. Even the smallest conservation effort helps. Given time, marine biologists say, many fish species will replenish themselves. In one part of Baja, Vance found that the biomass had quadrupled in the 15 years since the nearby community started fishing in a different spot. Like in Mexico, the native abalone population off the California coast plummeted from overfishing by the end of the last century. The voracious public appetite for the tasty sea snails drove a virtual gold rush among commercial fishermen. Before the federal government shut down the abalone fishery in 1997, commercial divers openly competed for the biggest haul. First, they fished the white abalone, then the pink ones, then the green, then the red. It’s a way of maintaining a fishery over time by exploiting one species to the point of decline, then switching to another species, then another, causing irreversible damage. Currently, California has a small recreational abalone fishery, and a thriving market for farmed abalone. And biologists from UC Davis have been working since 2000 on a captive breeding program to restore endangered white abalone populations. At the Bodega Marine Laboratory in Bodega Bay, Kristin Aquilino and her team have cultivated some 25,000 juveniles. They recently added another seven adults, bringing to their total broodstock to nine. Since the abalone crash, California has implemented the toughest fishing regulations in the nation, creating a network of Marine Protected Areas spanning more than 850 square miles of coastal waters, including 124 underwater refuges and off-shore islands. The state’s science-based policy and planning process has become a model for countries around the globe. MPAs protect natural and cultural resources by restricting human activities and, depending on the location, the regulations are enforced by local, state, regional, national and international authorities. But enforcement varies widely. According to the World Wildlife Fund, only about 4 percent of the world’s oceans are currently protected and the vast majority of existing marine parks and reserves are either poorly managed or not looked after at all. 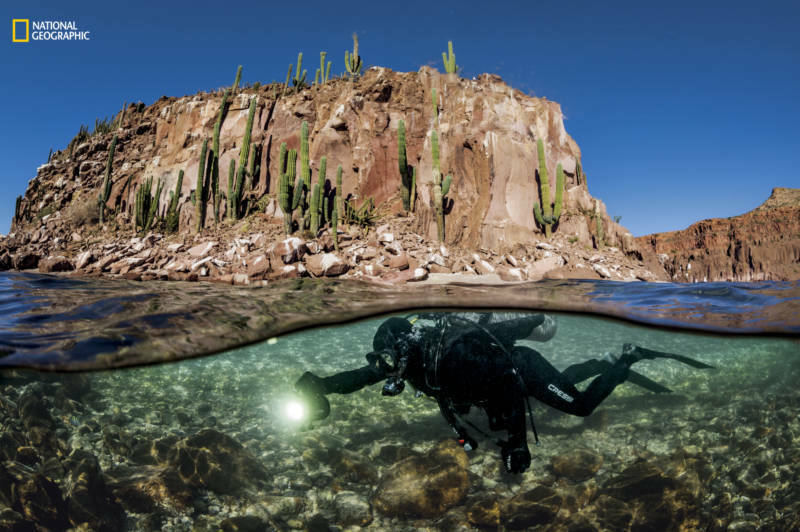 That includes the majority of the Marine Parks and Reserves on both of Baja’s coasts, which are home to the most diverse marine life on the planet, some of which exists nowhere else. 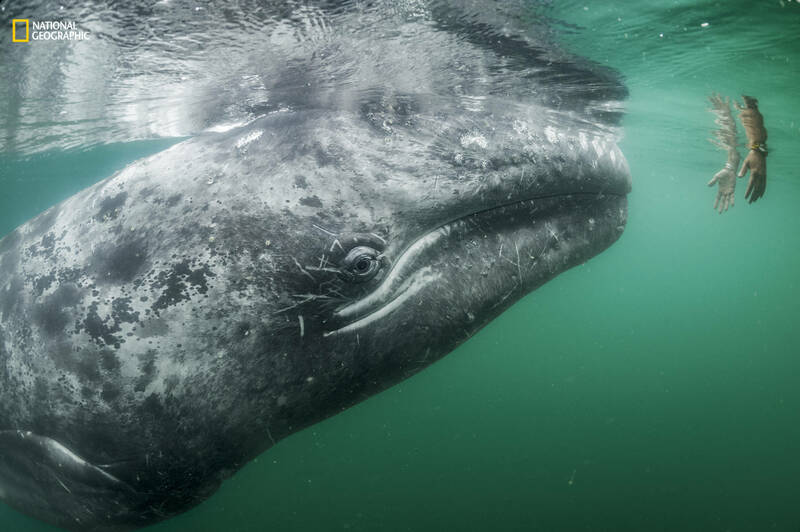 Many migratory species that are federally protected in California’s waters start their lives in Baja, including tens of thousands of gray whales, great white sharks and sea turtles. Right now, the only people charged with looking out for these animals are, for the most part, the residents of a few of Baja’s fishing villages. That worries environmentalists and researchers. 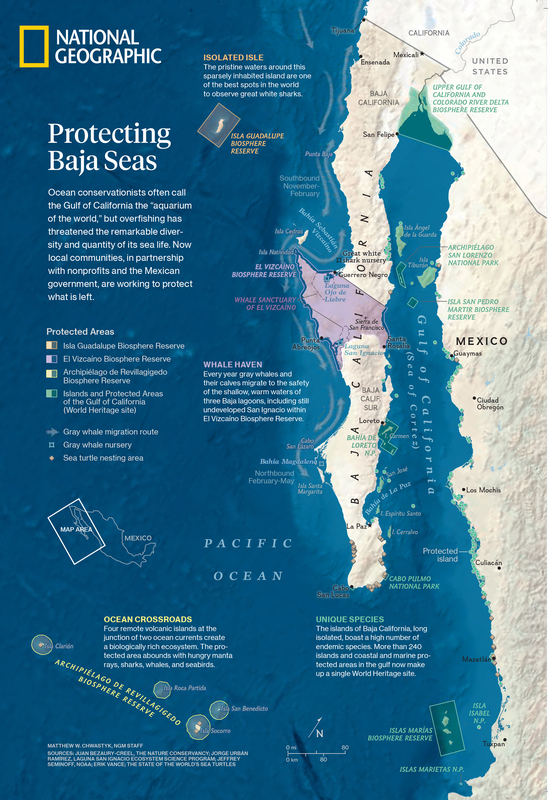 Scientists from Stanford University and the Autonomous University of Baja California have drawn up a proposal to create a transnational network of MPAs that would link Baja and California’s marine ecosystems, providing continuous monitoring and protection for species throughout the region. Environmentalists say that to be successful, any plan to protect the world’s oceans must empower coastal communities to manage local marine resources to benefit future generations.